Sure, you can use the regedit command to examine and edit registry entries, but you are not learning any AF or SCL. 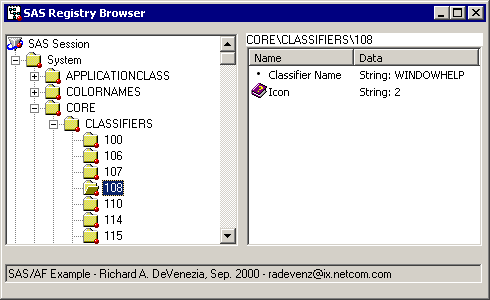 Also, this sample browser will show you the icon image when the registry entry is for an icon. The included source demonstrates the use of the V8 experimental controls, Treeview and Listview, and the not to well documented Registry class. Pay particular attention to the resizable attribute of treeview and attachments between treeview and listview. The attachments give the user an impression of a split pane window. Many thanks to Bart Guijt for providing assistance on how to populate the controls.